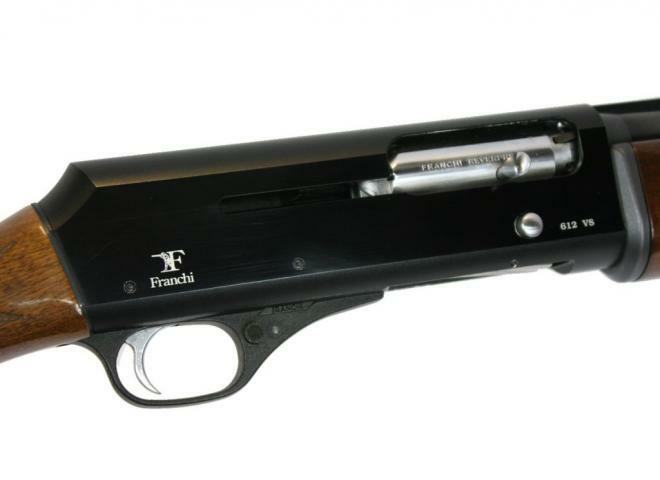 New Franchi 12 gauge semi automatic shotgun, great value, 3 1/2" synthetic with 7 year warranty. The excellent Franchi Affinity One - Synthetic. Interia operating system, built in Urbino, Italy. Fantastic cycling performance, steel shot proofed with 3" chamber. Supplied with full set of chokes and accessories. Franchi Spas 12. Section 1 shotgun. Rare gun and getting rarer, this one is in great conditions. Lever safety Front of trigger frame has been machined, it was like that when I got it. This is a 5 shot Max5. Requires an FAC to own. In good original condition. Affinity One is perfect also for a novice hunter, who has only recently received his hunting licence and wishes to try out a shotgun that is easy to use, while keeping one eye on price. Review by Jason Harris of Framlingham. Although not one of the names you might first think of when considering mass-market gunmakers, Franchi has had a presence in the UK market for many years. Franchi semi auto 12G in very tidy condition. The excellent Franchi Affinity One - wooden stocked variant. The Gun Room offers you the opportunity to purchase new Franchi Affinity 1, in Max 5 camo pattern, with a 28" multi choked barrel. Fantastic value for money 3 shot semi auto with Max 5 Realtree camo pattern, fitted with a raised rib these guns handle like a dream and come with an amazing 7 year warranty!! Franchi Veloce 20 gauge over-and-under ejector. As new condition, 3" magnum and super steel proofed, inertia driven so very clean and easy to maintain. Pre owned Franchi semi auto in Max 5 camo, still with all accessories. Franchi 720 Semi Auto 20 gauge Shotgun Multi choke,This has been well looked after with little signs of use, presented in a very good condition . The Gun Room offers you the opportunity to purchase a second hand Franchi Harrier Sporting, 12g O/U, with 30" multi choked barrels, in totally immaculate condition, cased with chokes.